Chris Walton trained at Jobin Jewellers serving a five year apprenticeship as a goldsmith and has over thirty years experience in producing high quality jewellery. 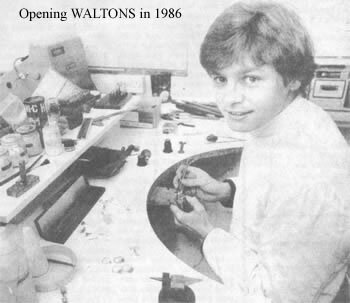 WALTONS opened in December of 1986 and quickly established itself as one the leading jewellers & goldsmiths in the area. WALTONS is currently celebrating its 25th anniversary. WALTONS specialise in making the perfect gift. As well as variously priced pieces to suit Weddings, Anniversaries, Birthdays and Christmas etc. WALTONS design and manufacture jewellery to mark other special occasions in the calendar, together with items which have their own sentimental significance to the giver and the receiver. WALTONS highly trained staff like to ensure purchasing a piece of jewellery is a memorable, interesting & exciting experience and we offer advice and personal attention. Customers are able to choose their own gemstones and will therefore feel involved in the manufacture of their commissioned piece. Any form of jewellery can be made to a customer’s own specifications, making it unique and the only one of its kind. Chris Walton is often invited onto Radio Berkshire & Radio 107 to be interviewed for his expertise & most recently regarding the Royal Wedding.